Some Windows 10 users have been facing issues when trying to activate their copy of the operating system. And this problem was not restricted to only those who upgraded from Windows 8.1 or Windows 7 to Windows 10, but even those who may have clean-installed. When attempts were made, users typically received a We can’t activate Windows on this device right now message. To address this issue, Microsoft has released a Windows 10 Activation Troubleshooter, that will, identify, troubleshoot and fix your Activation errors & issues automatically. The Windows Activation Troubleshooter will help you address most commonly encountered activation issues on Genuine Windows devices including those caused by hardware changes. The Windows Activation troubleshooter will open and try to fix the issues. One troubleshooting has completed, if it does not find any issues, it will inform you so. If you have changed your hardware, you may want to click on the I changed hardware on this device recently for further suggestions. 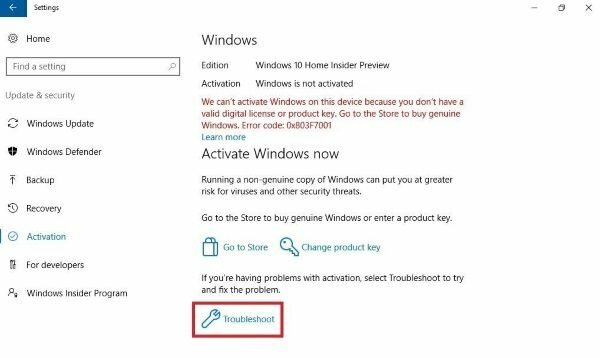 If your device has a digital license or digital entitlement for Windows 10 Pro from a previously installed activated Windows 10 build but you accidentally re-installed Windows 10 Home on such a device, the troubleshooter will automatically guide you through upgrading to Windows 10 Pro and activate Windows. This troubleshooter will be available in Windows 10 Anniversary Update and later versions and can be used to fix activations issues. I’m one of the lucky ones who have this problem after the Windows 10 “free” upgrade bricked an older Toshiba laptop. This article promised (by omission) a fix to the “activate” issue. Unfortunately, you have to have the insider version of Windows 10, which I do not have and don’t want. I’ll wait for the so-called Anniversary Update and see what happens.